White label options let you brand personally, so that no one will know you are using Slemma. NOTE: White label options are enabled for the Client Reporting plan. Navigate to the Admin page > White label. Set up custom domain for your Slemma app. Follow this article to learn more. NOTE: After setting up your custom domain, please let us know about that. We need this info to enable export options for your new domain. By default, it’s disabled for custom URLs. From your custom URL, Slemma will take the link to your app’s homepage that appears on the sign in screen. Default link is “slemma.com”. You can also upload a new favicon to display it on the browser tab. Log in to your dev account (or create a new one if you don’t have it yet) at the oAuth Client’s side. Create a new application at the oAuth Client’s side, fill all the required fields in the application form. Specify redirect URLs (your custom domain). Get and copy oAuth Client credentials (Client ID and Client Secret). Configure the connector in Slemma in the Admin > SaaS and Cloud storage section: paste Client ID and Client secret in the appropriate fields. Select the checkbox for Visible. Add the redirect link specified in the connector settings window to the Client application. 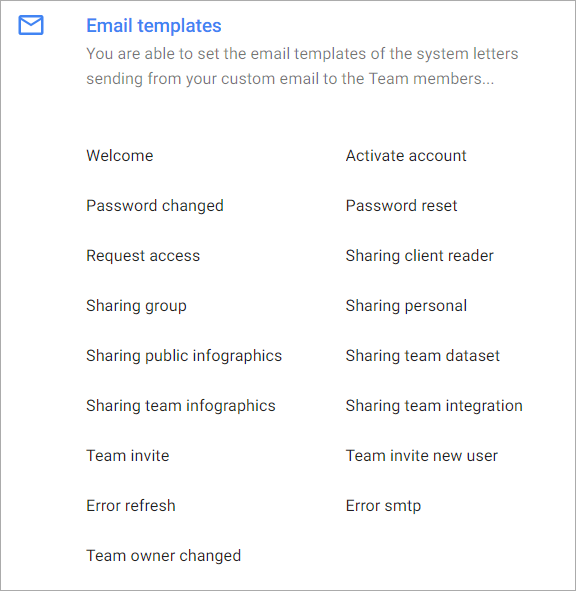 Set up your email, server settings and credentials to replace the Slemma’s email with your custom email in the system letters (invitation to the Team, changing the password, etc.) sending to users. This email will also be used to forward the support tickets to (instead of the chat window the email compose form will open). Default address is “support@slemma.com”. SMTP server: Enter SMTP of your provider, for example, smtp.gmail.com or smtp.mail.yahoo.com. SMTP port: SMTP ports may differ, but the most often used is 587. Encryption: The type of encryption depends on the SMTP server. Some servers support both SSL and TLS, whereas some servers don’t support encryption at all. Username and Password: Enter your email credentials. NOTE: Some SMTP servers could work without authentication. 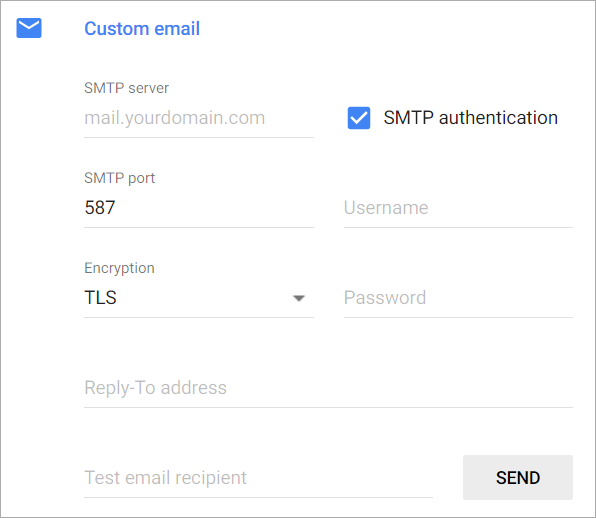 Then you should deselect the checkbox for SMTP authentication. Reply-To address: Enter the email address to replace your current email in the from field to the desired one. Some SMTP servers enable to replace addresser (e.g. google), but some don’t. If your server doesn’t enable this option, leave this field blank or just enter your mail account. Enter a recipient email in the appropriate field and click SEND in order to test the specified email settings. NOTE: If your SMTP server is smtp.gmail.com, the Username and Password fields become unavailable. This happens because Google uses OAuth. You should enter the password in a newly appeared Google window and then allow Slemma access to send emails. Within the White label options, you are able to set the email templates of the system letters sending from your custom email to users. Below these attributes, the HTML input area is located. The input area is a multiline text editor. Insert and save the text or use HTML code to generate the letter. The above parameters are replaced with the specific values in the emails. You can connect the desired Support service to your White-labeled Slemma version (Intercom.io and Zendesk are built-in). Select the appropriate support service from the dropdown and type in the required parameters to connect. If you want to add another Support service, write us at help@slemma.com or leave us a note in the chat. After that, in your White-labeled version, the icon will appear by clicking the button at the top right corner. When you click it, your Support services window will open. For standalone versions, you are able to set up connection parameters to support service (Intercom.io and Zendesk are available at the moment), which will open for users of the standalone version. With one of the above settings, the specified support service will open for all users (except of those who have the megaadmin rights) by clicking the Support button. In case when these settings are missing, a link to a new email (mailto:) with the standalone version admin address will open for users by clicking the Support button. For users with megaadmin rights, provided with the Internet connection, the Slemma’s Intercom window will open by clicking the Support button. At that, standalone version doesn’t provide Support settings in the White label section. You can specify a knowledge base link in your White-labeled version.